For US$700 a week, Rent a Recently refurbished and fully-equipped 2 BR 2 BA condo on the second floor. New granite, fully-equipped kitchen with new bathrooms, carpet and furnishings. Quiet location at the end of Barcelona Road. A 4 minute walk through a private, key-access gate brings you to an uncrowded section of 11 miles of wide beach. A starter kit of basic cleaning supplies is provided. You only have to bring your pool/beach towels. Play a round of golf on Shipyard - the resort is located on the 6th hole. Have a game of tennis on the newly rebuilt, on-site t tennis courts. Swim in 2 pools. Shop in nearby outlet malls. Bike on the 60 mile, paved path network or the beach. At the end of the day, relax on the deck overlooking a large lagoon with the setting sun and local wildlife. Kick back and enjoy life. The Master bedroom has a king size bed, a LCD TV, a private bathroom with tub, shower, toilet and vanity area. There is a patio door to the west-facing balcony's lagoon view and gorgeous sunsets. The guest bedroom has 2 twin beds and a door to the second full bathroom. The bedrooms are on opposite sides of the living/dining area for greater privacy. The fully-equipped kitchen is ready for any meal preparation. Gas BBQ's are located directly behind the unit with a great lagoon view. Picnic tables and a swing are there for your enjoyment ! We are retired and enjoy travel and an active lifestyle. Relaxation on holidays is also a must. The beach and seafood are two of life's greatest pleasures. We look forward to family vacations here with grandchildren. Brigantine Quarters is an amazing fit for us. Hilton Head offers many activities as well as outstanding relaxation possibilities. It is a unique ecologically-friendly resort location. Miles of wide beaches and warm water are very inviting in fall. What a way to extend summer fun! Brigantine Quarters is clean, well-kept and newly refurbished. The management company does a great job and is easy to deal with. There is an on-site maintenance man. It is a cul-de-sac location at the end of Barcelona Road so it is very quiet, yet close to the beach through the private gate. Golf courses and tennis academies are 3 minutes from the resort. At day's end, the peaceful lagoon view is very relaxing. Bathroom 2 has a shower, tub, sink and toilet. A 4 minute walk through a private locked gate puts you on a 12 mile long, hard-sand beach. 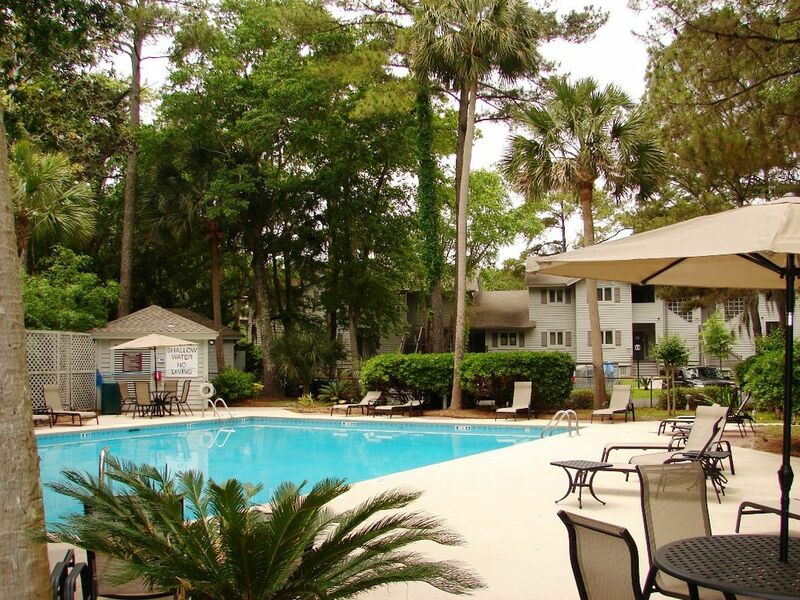 Adjacent to the desirable North Forest Beach area, close to Coligny Plaza, 2 pools - one heated, 2 tennis courts on-site sign-up is free to play, kids playground, unit has a lagoon view, free long distance telephone in the USA, free wi-fi, a short 4 minute walk to the beach (2 blocks) through a private key access gate included in the rental, very quiet, cul-de-sac location in Shipyard plantation, shopping is a 10 minute walk, 5 minute bicycle ride away. All taxes and fees included. $100 authorization on a credit card will be required at check-in. Will be released first business days after check-out if there are no damages.